Late last year, Github beta-released something they have called Github Actions. It responds to Github Events and starts off workflows that use docker containers to do the work. It resembles Bitbucket pipelines, but using the myriad of Github Events gives Github Actions extra granularity than just reacting to git push events. Apart from that, the workflow UI is a real treat and unlike anything I have seen before. At Unacast we found Github Actions particularly interesting, and I’ll tell you why and how. There is two pain points with this, and that is the Hubot deploy plugin and Heaven. Both repositories are no longer maintained. In addition Heaven is giving us some hell. We have a lot of projects, well over 120 repositories, and a well of different programming languages and servers to deploy to. This demands that Heaven needs to accommodate all of these deployment-scripts, as well as being able to authenticate to all servers. In a fast paced development, this hinders us a bit. It’s hard to update Heaven, and only a select few have access to deploy Heaven. Also the extensive authorization Heaven has, is not something we are comfortable with. So when we got our hands on the Github Actions beta, we set out to see if it could replace Heaven. 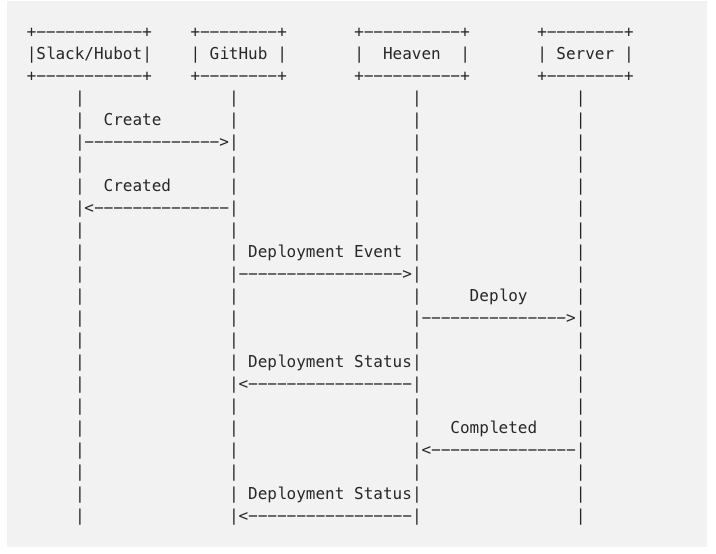 In short Github Actions is for us the new Heaven. One should try to look at Github Actions as a third party solution, and not an integral part of Github, although it kinda is. The real good part is that within the workflow, you are already authenticated with Github. That means you can easily fire new Github Events inside your workflow, or docker containers to be more precise. 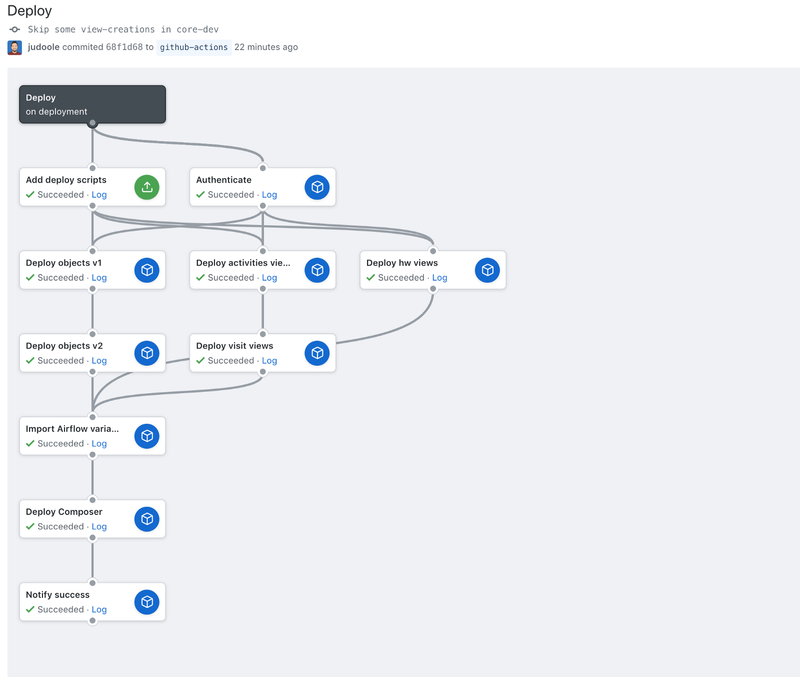 A workflow we use for deploying to Google Cloud Composer. 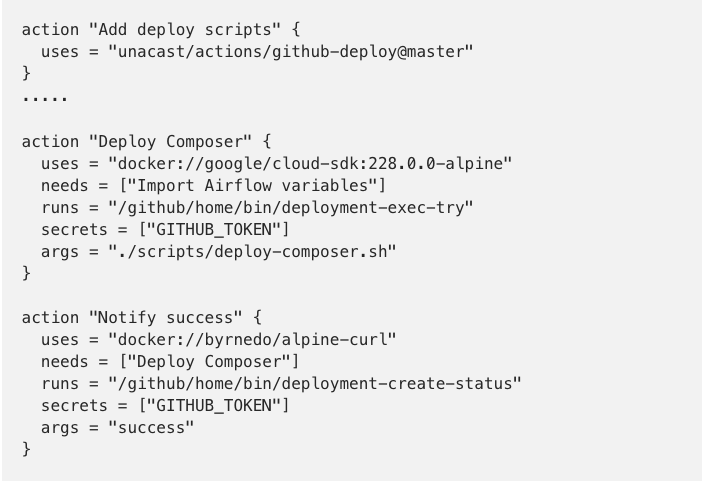 This workflow authenticates to Google Cloud, runs migration scripts and deploys Composer. At the end it notifies Github Deployment API of the success. Github Slack Integration ensures that deploy events are sent to Slack. Github has created some really nice pre-built actions for everyone to use or build upon. One being gcloud auth which we have used in the Authenticate action in this example. It uses a token for a service account and does a log in, which later steps(containers) are able to use. This gives us the freedom to create or pick and choose which docker container we would like to use in the actual deploy. In our case we use the official gcloud docker image from Google. All in all, this works great when everything is successful. But what happens if one of the actions fail? Well, first of all every parallel actions are killed immediately. Secondly, there is no update to the deployments api, except for what you do yourself. That means there isn’t any notifications to Slack that this went sideways, and the deploy is listed as Deploying and after some time Abandoned in Github. This means we have to update the api, within the containers, ourselves. Which is a bit tricky, because the containers themselves differ a lot and could potentially contain only a bare minimum of tools. So, to create a tool that can be reused across actions, it needs to have as little container-dependencies as possible. For this, we create a bare minimum repository of actions, the first being deployment. Now, if something fails in “Deploy Composer”, the function deployment-exec-try ensures that the deployment api is notified of the failure, and pass on the exit code which result in the workflow being stopped. We have put all of these functions in an open repository, free of use for all of you out there. So please use it, comment, create issues or better yet create pull requests at unacast/actions/github-deploy. Should I abandon my CI for Github Actions? Keep your pants on, just a little longer I would say. First and foremost, it’s just in beta, so you might have to endure some rapid changes. And who knows, Github might even drop Actions totally. Although I think that is highly unlikely, given their competitor Bitbucket already has fully working pipelines and Github seems to invest heavily in it. So far we haven’t gotten any hints on pricing. A good guess could be to compare to other services as Circle CI, Travis and Bitbucket. For Github Actions to be competitive I think they have to put themselves in that range. There is also some hiccups, that I am certain will be smoothed out before final release, such as slow startups, streaming logs, integration with the Checks API and general error handling. Here at Unacast we are testing Github Actions on a small set of repositories and are enjoying it immensely. We are still using Hubot creating deploy events, but I want to give a big shout out to Slashdeploy, who not only replaces the need for Hubot deploy and Github Slack Integration, but also moves configuration from the Hubot repository to the repository that is actually deployed. A lot more comprehensible! So that is us from Unacast, I would love to hear if any of you have started using it!